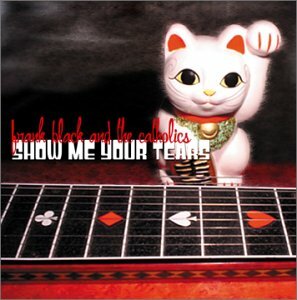 I finally got my copy of Show Me Your Tears, the new album from Frank Black and the Catholics, and have been enjoying it very much. I'm trying to come up with a description that isn't useless. You might call it Frank Black's Nashville Skyline - a country and western album from a parallel universe. The songs are much more subdued than in previous albums, ranging in mood from smoky nightclub, to blues rock, to a kind of twangy country arrangement. On one song, "Coastline", you can almost hear Frank Black sipping whisky from James Taylor's skull. I think this album has come to rescue all the Tom Waits and Leonard Cohen fans who are worn out from waiting five years between releases. If you weren't aware that Frank Black is a splendid lyricist, it might be time to come into the light. The velvet-lined UFO has landed, it's here to save you! Back when I lived in France, I once walked in on my friend and housemate standing by her stereo, white as chalk. She had put on one of my CDs while I was out painting (part of an ongoing effort to See Into My Mind), and suddenly there was Black Francis hollering "EXTINCTION! EXTINCTION!" at the very top of his lungs. I have never seen anyone more mortified. If the album had been Show Me Your Tears, I would have found my friend seated in her window, holding a big snifter of cognac and smoking a long cigarette in an ivory holder. She might even have been humming along - it's that kind of album. The songs are sad and beautiful; in a world without Clear Channel, they would be all over your radio. Play the album at your cafe or bookstore, and chicks will dig you. Where else will you hear a rocking blues about the four virtues of Jainism? Who else writes spooky songs about Manitoba? What really blows me over is that the album was recorded live, without edits, to two-track (just like Frank Black's last three releases). That means what you hear on the tape is what the band played in the studio, without cuts or superpositions. It's like knowing that a picture was painted from life, or watching the Iron Chef invent a four-course meal from broccoli stalks. Skill! Buy, buy, buy this album.